Instant Pot Jambalaya is a comforting meal that can be made in under an hour and feeds an army of people. Makes for perfect leftovers for lunch or even dinner the next day. 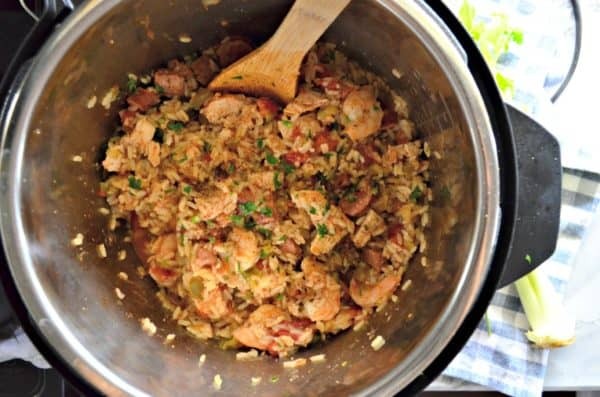 Many years ago I published my recipe for crock pot jambalaya. To this day, it has been one of my most visited recipes of all time. Rightfully so, given that I make it for my family at least once a month. Its New Orleans comfort food at its finest. Is it very authentic? Meh… I’m not Cajun and have only visited the region once. So some might argue with it’s authenticity. But, dang is it good and has all the flavors of New Orleans in one pot! If you love chicken, spicy andouille sausage, and shrimp paired with a tomato-base rice. 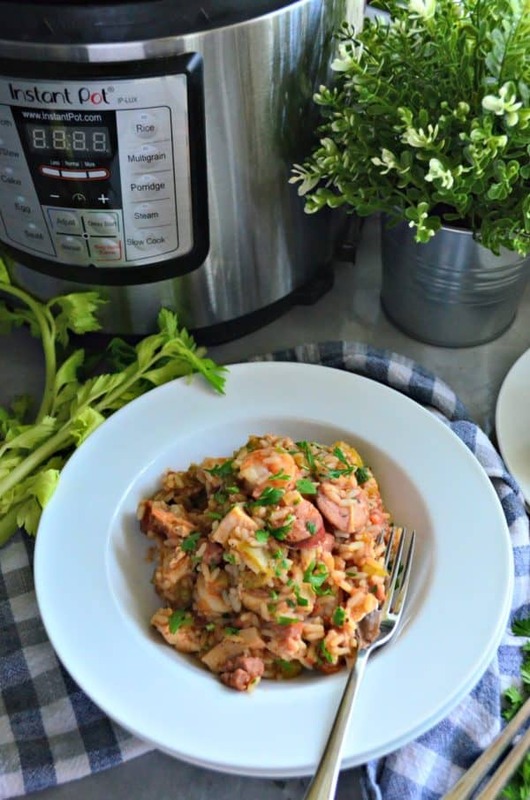 I think you will love this recipe for Instant Pot Jambalaya. How long will this jambalaya take to make in the Instant Pot? What I love about this Instant Pot version of my most popular recipe is that it doesn’t take 8 plus hours to make. It takes under an hour. Including prep time and pressure time it takes about 45 minutes. Some mornings, I don’t have the time to prep all the ingredients for this recipe. I like that I can do it in the afternoon and still yield the same great results in under an hour’s time. Can you prep this meals ahead of time? If you want to get ahead of yourself you can easily prep this meal ahead of time. You can place all the chopped vegetables, seasonings, sliced andouille and chicken breast in a ziplock bag or container. This will cut the prep time prior to cooking the Instant Pot Chicken, Andouille Sausage, and Shrimp Jambalaya. Is Instant Pot Jamabalya hard to make? This recipe for Instant Pot Jambalaya does require quite a bit of prep (like stated above). You also have a few steps in the process of cooking. I would give this recipe an “intermediate” ranking when it comes to Instant Pot recipes. You will need to open/close the Instant Pot a total of three times. Not your typical Instant Pot recipe that typically just a one and done open and close. I promise these steps are key in yielding the very best meal. I’ve shared these various steps so that way your chicken doesn’t dry out and you have juicy plump shrimp. 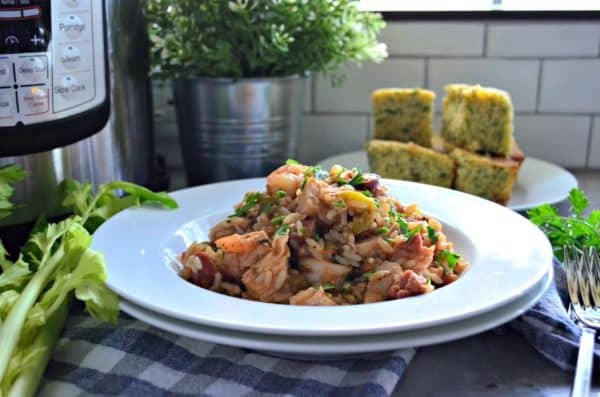 What do you serve with jambalaya? I love to serve cornbread with our jambalaya. I love this recipe for sour cream garden herbs cornbread. This is not my recipe, but a recipe I go to time and time again. (It’s what is in my photo’s for this recipe). If you are on a gluten free diet I found a great gluten free cornbread recipe for you. 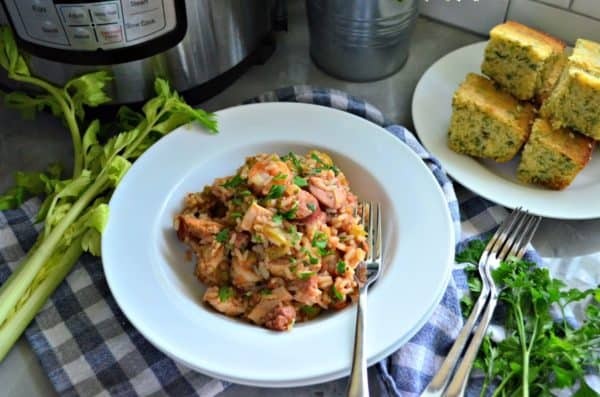 This jambalaya recipe is gluten free so it’s a double win in your book! If I’m entertaining with this recipe I like to add a salad to the side. Is jambalaya a good recipe to entertain with? Anyone I’ve ever served this recipe to, have enjoyed a second serving. Expect them to ask you to make this recipe again. This is why it’s a fan favorite. It’s also ideal because you won’t be cooking a lot while your guest are over. Plus–you won’t have excess dishes to clean once your guest leave. 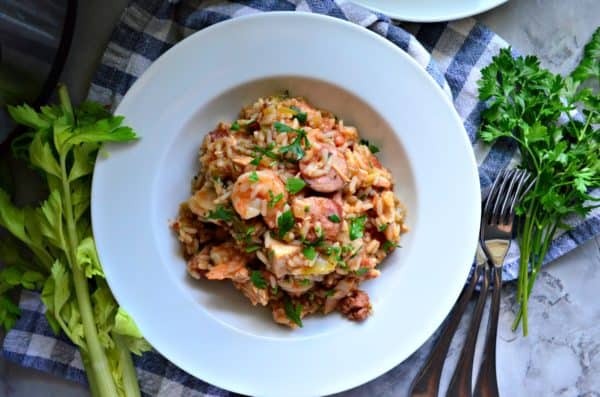 If you want to bring a taste of New Orleans in your home I highly suggest you try this easy recipe for Instant Pot Jambalaya.